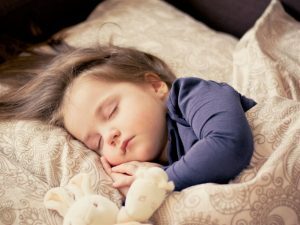 It is important to have a well planned, consistent bedtime routine so as your child is aware sleep is approaching. The relaxing bedtime ritual helps transition your little one, from being wide awake to being sleepy and relaxed and ready to sleep all night long. The routine helps the body produce the sleep inducing hormone (melatonin) making it easier for them to drift off. A sleep routine that is consistent, creates feelings of comfort and security. Most importantly, it is a special time for parent and child to reconnect and enjoy closeness,after hectic days when family life often takes a back seat. It’s never too early to start a bedtime routine. From the night you get home from hospital with your new baby, things can be put in place to start shaping day from night time. Yes it is going to take a bit of time for your baby’s sleeping and feeding cycles to fall into a pattern so as day is separated from night. However, if you persevere and are consistent, a positive sleep pattern will eventually emerge. Likewise it is never too late to start, so plan, discuss and begin. Ideas that may be included in a good bedtime routine. Reading stories promotes the bond between child and parent. You can read the same book every night, in fact children like if you do. They feel secure if things are predictable. That is not the only reason the same book works. Researchers say that reading the same book over and over can develop their logic skills. Also repetitive reading can increase vocabulary and ability to recognise words as well as, fluency, comprehension, pattern and the rhythm of the text. Massage improves babies sleep. Research shows that little ones who are massaged before bed, fall asleep faster, sleep deeper and longer! It also is such a lovely way to reconnect with your baby at the end of the day. It is also said that massage, improves the immune system and improves growth and development. It improves digestion, colic and relieves stress for not only your baby but also the masseuse! Most babies and children love bath time and lots of parents have this as a part of a bedtime routine. It’s very relaxing and comforting for your baby(which sets them up nicely for sleep). It also helps build and maintain that special bond between the you both and it encourages development of your child’s fine motor skills and hand eye coordination. It can also help with colic in the early months. No matter the age, both talking and doing it quietly are important. I remember having the sweetest most sincere conversations with my babies before an age of being able to understand them. They just loved to make sounds and were delighted that Mummy or Daddy were paying attention and conversing. Obviously conversations with your baby changes as they get older, one of the major developments being you can understand them ? Something to remember with your older child is to discourage chat about worries right before bedtime. If there is a worry that needs to be addressed, have a specific time during the day to talk ….but bedtime is a worry free zone. Electronic technology may have it’s place, but not during the lead up to bed. The blue light from the gadgets plays havoc on the sleep inducing hormone , melatonin and changes in sleep pattern can in turn affect your child’s natural body clock. So make a rule…no gadgets well before bed. Leading up to bedtime, you want to induce an atmosphere that encourages your child to become sleepy. During the summer months, the evening sunlight streaming through the windows is not sleep provoking. So I’d say sorry but shut it out a good hour before bedtime. As we know sunlight is not a major issue during the winter months, but it’s worth being mindful of the lighting used in the house, use table lamps as apposed to bright ceiling lightening. When deciding on a bedtime routine make sure all carers are involved and you are all working as a team. Kids thrive on the consistent approach. If your little one is of an age where they understand, include them in the ‘bedtime planning meeting’, they will adapt easier to what’s expected if they are involved from the start. 3 meals per day sometimes just isn’t enough to sustain a growing child through the night, so a healthy snack before bed might be required. This might be a bowl of cereal, toast, fruit.. The snack would be best given at the start of the bedtime routine, allowing the food to settle and time for teeth to be cleaned before lights out. Practising yoga just before bed can help your child calm their mind, release energy, stress and tension. It relaxes the body and the mind and can help them fall asleep faster and have a better night’s sleep. Dentist recommend that we brush our children’s teeth after the last bottle or snack of the day. So it is vital to include it in part of the bedtime ritual to prevent decay. This is probably the number one method chosen by potty trained toddlers and older kids to stall bedtime. Therefore it is definitely worth having a conversation about the last visit to the toilet before lights out. That visit to the toilet should be factored into the routine, the results celebrated and then bed. Because you have shared a chat about ‘the last visit’ earlier in the day and you know the toilet task was completed, your little one will accept when you can firmly say ‘you’ve been and now it’s bedtime’. I know this one goes without saying , but if I left it out you might think I don’t think ‘a cuddle’ is necessary. Cuddles are so important, as we know physical contact makes us humans feel secure, so lots of hugs and kisses before bed is a vital part of the bedtime routine. How long should the routine take? I would say a bedtime routine should take around 30 mins, this gives enough time for your child to become relaxed and ready for bed. It is worth planning roughly what is going to be included as 1/2 an hour can pass pretty quickly and you can find the routine has lasted a lot longer than you had anticipated. Be aware of your child’s natural bedtime and start the bedtime routine 30 mins before this.